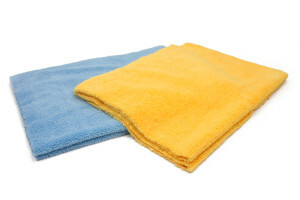 The Elite Plush Microfiber Detailing Towel is designed primarily for use on fine painted and clear coated surfaces - on products like automotive surfaces and guitars. 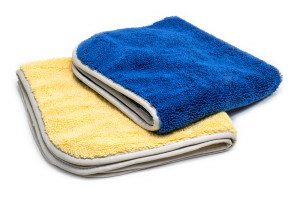 Our single microfiber plush towels are woven so that one side has a high pile with long fibers, and the other side a low tight pile. The high pile side is for delicate jobs where a gentle soft cleaning surface is needed, the long fibers pull dirt and debris away from the surface where it is less likely to scratch. The low pile side can be more aggressive and cut through polish residues with ease. 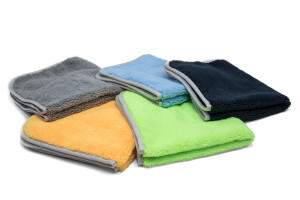 The high-quality microfiber plush towels are designed with various edge types, from silk and cloth banding to hemmed and ultrasonic zero edge (edgeless) cuts. We offer various sizes ranging from 12” x12”, 16” x 16”, 16” x 24” to 25” x36”.